Mr. Naveen Vyas is the Executive Director and Fund manager of Microsec Wealth. He has done his MBA Finance from Visvesvaraya Technological University (V.T.U) at Dr. Ambedkar College, Bangalore. He has over 12 years of Experience in capital markets with core focus on fundamental analysis, investment advisory and fund management activities. He has worked as VP Research for Microsec Capital Limited for more than 8 years and has been Ranked No.1 Analyst in Bloomberg BARR in the consumption space companies and has also been nominated for ZEE Analyst Award in FMCG category in 2013 while working for Microsec. Later he has been associated with LN Bangur Group, wherein he has been involved in managing the Prop-desk Equity Funds of the group. During his tenure of around 4 years, he has gained good experience of fund management activities wherein the Prop-desk Equity Fund’s return has outperformed the Free Float NIFTY Midcap 100 and NIFTY Free Float Small Cap 100 Index’s return. Mr. Ishan Daga is ‘Head – Investments’ at Microsec Wealth. He has over 12 years of experience in Global Equities with a concentration on Indian Markets. His core expertise includes fundamental analysis of companies, valuation and fund management. Ishan worked as Vice President – Research at Microsec for over seven years and stayed the top-rated on Bloomberg BARR for all the stocks under his coverage. He was also nominated twice for Thompson Reuters Starmine Analyst Awards. While working at Microsec, Ishan also got nominations in Zee Analyst Awards for the years 2013 and 2014. Ishan has also worked as ‘Senior Manager – Investments’, at Emami Group and also brings in experience of working as ‘Head of Research’ at Arya Group, Ahmedabad, where he was involved in handling end-to-end fundamental research activities of the group. In academics, a ‘Chancellor Medal’ holder from MDS University in Commerce, Ishan is a Gold Medalist in ‘PGDM – Finance’ from BIMM – Pune and a Gold Medalist in M. Com. from MDS University, Ajmer. 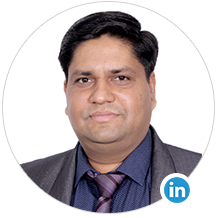 Mr. Deepak Kumar Agarwal is the Executive Director and Chief Financial Officer of Microsec Wealth. He holds a bachelor’s degree in commerce from Calcutta University. He is a Chartered Accountants and a Company Secretary. He has an experience of more than 12 years in financial planning, taxation, strategic planning and investment banking.